Honorary Members / Friends of the Glens - Website of Glens' Association! Doctor Jean-Pierre Benamou, OBE, MSM, MT is an orthodontist by profession and a historian by passion. As a Boy Scout, he started collecting artefacts in the fields of Normandy following the Second World War. He established the "Musee de la Battaille Normandy" in Bayeux, Normandy. Following attempted political interference, he removed his collection. He now operates the "D-Day Normandy Academy" (http://ddaca.com) as a mobile teaching facility pending the construction of a new building alongside the German gun battery at Longues-sur-Mer. Jean-Pierre has generously closed his office to act as host and tour guide for Glens Tours in the Normandy area for over 20 years. He has been instrumental in the installation of Glens plaques at Magny, Courseulles-sur-Mer, and Bernieres-sur-Mer. Jean-Pierre was awarded the "Order of the British Empire" by Queen Elizabeth II and the "Meritorious Service Medal" by Governor General Adrianne Clarkson. He has been recognized as an "Honorary Life Associate Member, 1st Battalion, SD&G Highlanders", a "Friend of the Glens", and an "Honorary Life Member, Glens' Association". Reverend Hendrick (Henk) J. Dykman as a young boy witnessed the SD&G Highlanders attack at Leesten, The Netherlands on April 4, 1945. He is a retired United Church of Canada minister living in Guelph, Ontario. In 1993, he attended the reunion of the 1st Battalion, SD&G Highlanders Association. This was the start of a long relation with the Regiment. He used the occasion to visit with Frank and Fleurette Periard of Alexandria. Frank's older brother was Corporal Aime Periard who died about 300 yards from the Dykman home on April 4, 1945. In 1994, Henk led Frank over the ground that his brother would have covered before being shot. On that trip, Henk accompanied by Frank Periard visited the Mayor of Warnsveld. this visit planted the seed for the memorial in Warnsveld that commemorates 33 Canadians and one British soldier killed including 11 Glens during the liberation of the area. This started Henk's efforts to locate families of the Canadians who paid the supreme sacrifice from April 2 to April 6, 1945. The Warnsveld Memorial was unveiled on May 1, 1995. Whenever Glens visit the area, there is always a memorial service at the Warnsveld Memorial. Henk was also instrumental in the naming of ten streets and one bridge in the new developments in Leesten after the 11 Glens killed on April 4, 1945. Rev. H.J. Dykman was recognized as an "Honorary Life Member" of the Glens' Association in 2009. 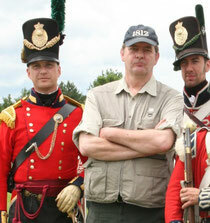 Donald Edward Graves is an internationally known expert on the War of 1812. 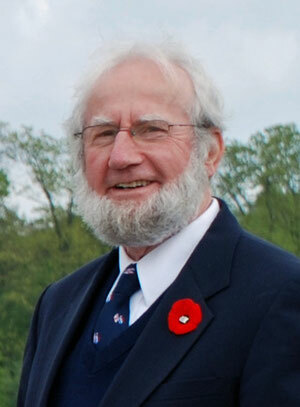 He has written a number of books on the War of 1812. 1812. In recent years, Donald Graves and others have lobbied hard for battle honours on behalf of units such as the Stormont, Dundas & Glengarry Highlanders. At the Association’s general meeting in March 2013, Donald E. Graves was made an honorary life member of the Stormont, Dundas & Glengarry Highlanders’ Association for his efforts in lobbying for the three War of 1812 emblazonable battle honours awarded to the Regiment. Fred Jones, son of a British soldier and his Belgian bride, raised in Knokke, Belgium, developed an obsession for war memorabilia and history at an early age. Knokke (now Knokke-Heist) was liberated by the SD&G Highlanders together with the other 9 Canadian Infantry Brigade infantry battalions - Highland Light Infantry and the North Nova Scotia Highlanders. Fred, his mother and brother Danny have hosted Glens Tours for nearly two decades and guided them in the Knokke-Heist and the the Battle of the Scheldt areas. Fred had a long-time goal of establishing a collection of WWII artefacts and opening a museum in the Knokke-Heist area. Part of his collection include items donated by members of the 1st Battalion, SD&G Highlanders. 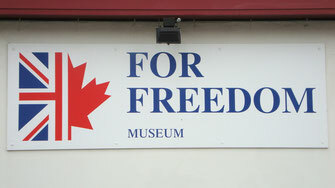 In the Spring of 2009, Fred's first class "For Freedom Museum" was opened in Ramskapple on the outskirts of Knokke-Heist. Information on the "For Freedom Museum" and the great pictures of its displays can be found at ﻿﻿www.forfreedommuseum.be. If you cannot make the trip, these pictures are second best. The museum has been rated as the second best of eight things to do on a visit to Knokke-Heist, Belgium. Since the 1st Battalion, Stormont, Dundas & Glengarry Highlanders played a key role in the liberation of the Knokke-Heist area during the end of October and November 1st, 1944, Fred Jones had ensured that Glens are well displayed in his museum. Our first visit was in 2008 while the museum was under its initial construction. For those of us who returned on the Glens Tours of 2009 and 2012, we were impressed by the progress that had been made to ensure that the "For Freedom Museum" is a high quality military museum (as was the group visiting in 2018). There is now a "For Freedom Pipe and Drum Band" that dress in our tartan and glengarries. The band welcomed the 2018 Glens Tour to the museum. In 2008, Harold Kip was a young resident of 10 Hawkinsstraat, Leesten, The Netherlands. He became interested in the origins of his street's name and started doing some research. Soon, he became obsessed with the Glens and became good friends of Harm Kuijper. We came to know Harold during the 2008 GlensTour. 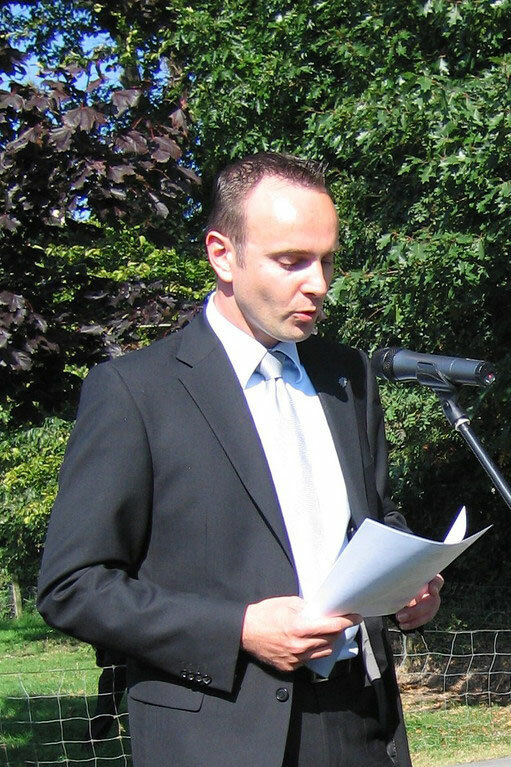 This picture of Harold was taken during the memorial ceremony at the Warnsveld Memorial in September 2008. During our visit, Harold hosted a street party at his home for our group, for all residents of Hawkinsstraat, and others who participated in the ceremonies that day. The street party stands out as a high point on the 2008 Glens Tour. Harold and Harm Kuijper were again hosts to a Glens Tour in November 2009. This time, we had a great time interacting with young students at a local school (Lea Dasberg School). 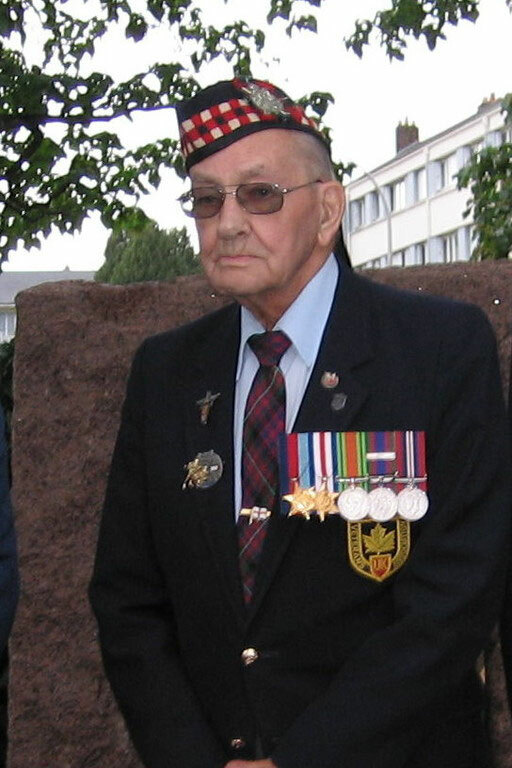 Harold Kip is a "Friend of The Glens" and was made an "Honorary Life Member" of the Glens'Association in 2010. Harm became known to the Glens' Association during the planning of 2008 Glens Tour. Harm lives in Warnsveld, The Netherlands. He graciously co-hosted Glens' Tours in 2008, 2009, and 2012 when in the area of Zutphen, Warnsveld, and Leesten. Harm and his brother are actively involved with the Normandy Veterans Association. Harm's great website can be found at www.nvafriends.nl. Harm is a "Friend of the Glens". He was made an "Honorary Life Member" of the Glens' Association in 2010. John Angus McDonald, Corporal, 1st Battalion was one of three brothers who landed in Normandy as members of the 1st Battalion, SD&G Highlanders. Regretably, his brother Francis died of wounds shortly after D Day. He and his fellow Glens began the tradition of annual reunions in 1948. His efforts to maintain the regimental system were recognized by his peers when he was made "Honorary Life Member of the 1st Battalion Association". With the closure of all branches of the 1st Battalion Association, John Angus serves as the patriarch of the new Glens' Association. 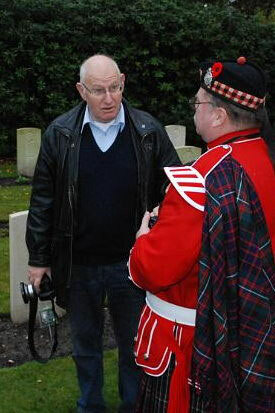 He provided a wealth of knowledge for the younger Glens coming behind concerning Glens Reunions and Glens Tours. 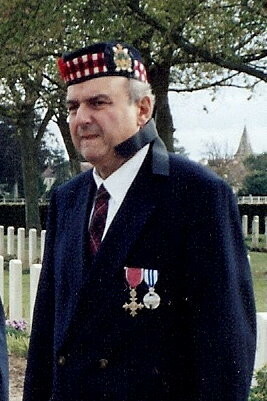 This picture of John Angus was taken during the 2006 Glens' Tour at the Glens' Memorial, Caen, Normandy. 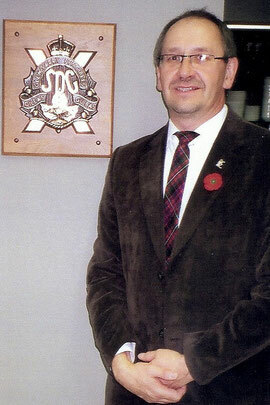 Quite rightly, John Angus McDonald was recognized as the first "Honorary Life Member" of the Glens' Association in 2007. John Angus died on February 20, 2012. Dileas Gu Bas. The Westlake Brothers Souvenir Association is a group of young people from the Caen area of Normandy. 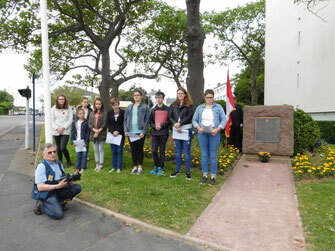 Under the leadership of teacher Christophe Collet, the young Normans of the Association have been honouring Allied soldiers who paid the supreme sacrifice liberating their country from the Nazis during the Second World War since 2006. The Glens met them during the Association’s 2015 pilgrimage to Canada when they conducted 20 commemorative ceremonies including one in Cornwall. A friendship was established on that visit. Since then for the Glens, the young people have held an annual ceremony at the Glens Memorial in Caen, as shown here, along with the many others they hold in Normandy. A moving twilight remembrance ceremony was held at the Beny-sur-Mer Canadian War Cemetery remembering the Glens buried there for the people on the 2018 Glens Tour. “Friend of the Glens” certificates were presented to the young Normans at the end of that service. Wigger van der Horst's home in the Zeist area of The Netherlands served as a billet for members of the 1st Battalion, SD&G Highlanders following V-E Day and pending their return home in December 1945. He remembers the Glens being in his home. Later in his life, Wigger discovered a photograph in his deceased parent's papers. The photograph was of a group of about 150 Glens taken at a nearby school in 1945. He became obsessed with identifying everyone in the photograph. This photograph became many photos, hundreds of e-mails, many long distance telephone calls, and several DVDs. Wigger has become so involved with the life of the Regiment that he often notifies the Glens' Association of the passing of 1st Battalion members. During our 2008 Glens Tour, Wigger presented a series of Dutch postal stamps that he designed in honour of the Stormont, Dundas & Glengarry Highlanders. He has also designed signs for all Glens gravesites in the Holten Canadian War Cemetery. This photgraph (courtesy of www.nvafriends.nl) of Wigger was taken in November 2009 in the Holten Cemetery. Wigger is with Drum Major Perry Coughlan. They are standing in front of the grave of a Glen. Wigger's gravesite sign can be seen at the lower left. 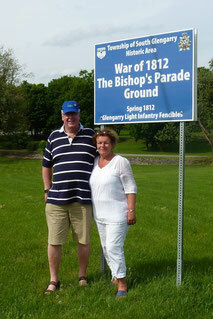 Wigger and his wife Lenie are gracious hosts during the Holland segement of Glens Tours. Wigger is a "Friend of the Glens". He was made an "Honorary Life Member" of the Glens' Association in 2009.